Get Some Lights In There! 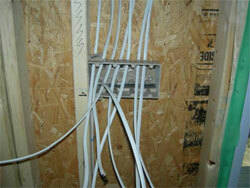 The electrical wiring rough-in process is performed while the walls are bare and no insulation has been installed. Each circuit, be it for lights, light switches or outlets, is routed throughout the house's frame through a series of holes drilled in the 2x4s and joists. This is the part of the process that you may want to double check that the outlets, light boxes, switches and canned lights are in the correct place, as moving them after drywall is considerably costly and time consuming. Our electrical contractor from Ryland Homes was courteous enough to meet with me before they began installation to re-affirm where I wanted some of the optional outlets and lighting in the home. The Wiring, for all intents and purposes are run in what appears to be a hap-hazard fashion, as the electricians will run direct wire pathways to each location with little regard for routing or aesthetics. All of these wires will be covered by the drywall so it is of little concern. It is advisable to take some photographs of the wiring for future reference. Any homeowner would know that the over-all basic process of electrical wiring rough-in is anything but simple. If you are thinking about personally tending to the task of installing your home's wiring system, you have to ensure that you have the necessary tools and skills that will allow you to finish the job. Since you will be dealing with a very powerful, not to mention harmful, element, you have to see to it that you are well versed with the over-all process that it will entail. If you have no particular experience when it comes to performing this task, then it is highly advised that you leave the job to the professionals. Of course, you can help and assist in the over-all process, but you need to get the help of someone who knows what they are doing to ensure that you and your family will be safe once you move into your new home. The first thing that needs to be done in installing electric wiring to a new home is to assess the electric needs of the various areas of your new house. Obviously, bigger rooms and areas will need more electric power, with the lighting fixtures and appliances that you will place in it. Get the help of a good contractor in drafting the wiring plan that you will use in your house. See to it that you place the necessary socket and light allocations for every single area as well. Get the help of a professional in buying the different components that you need for your home's electrical wiring system as well. If you know absolutely nothing about this type of task, there is a possibility that you will be buying the wrong elements for your home. To avoid wasting money on components that you will not be able to use, make sure that you get the opinion of someone who is well-versed in the field. See to it that you look for discounts that you may use along with your purchases as well, since the top quality materials are usually sold for steep prices. Try to buy the best materials that you can possibly find, because using sub-par parts and materials can present you with harmful problems in the future. Once you have bought the materials that you will use to put together your electrical wiring system, you may now go on to the task of installing the components that you need. Obviously, you would have to turn off the power from your house for this stage, for doing otherwise will present great possibilities for damage. It is highly advised that you supervise this stage of the process, even if you are confident about the skills of the professionals that you have hired. This way, you will be able to ensure that all the parts of your electrical wiring system will be installed properly. After you have installed all the components that you need for your new home's electric wiring system, the final thing that you should do is to surround the parts with enough installation that will protect them from the different types of outside stimuli. This part is very important because it will protect your over-all system from the different signs of wear and tear and keep your home as safe as possible. Yes, the individual components will come with their own installation, but it will do you well to have additional installed as well. This way, you will be able to ensure that you will not have to deal with any problem when it comes to using your new home's electric wiring system.